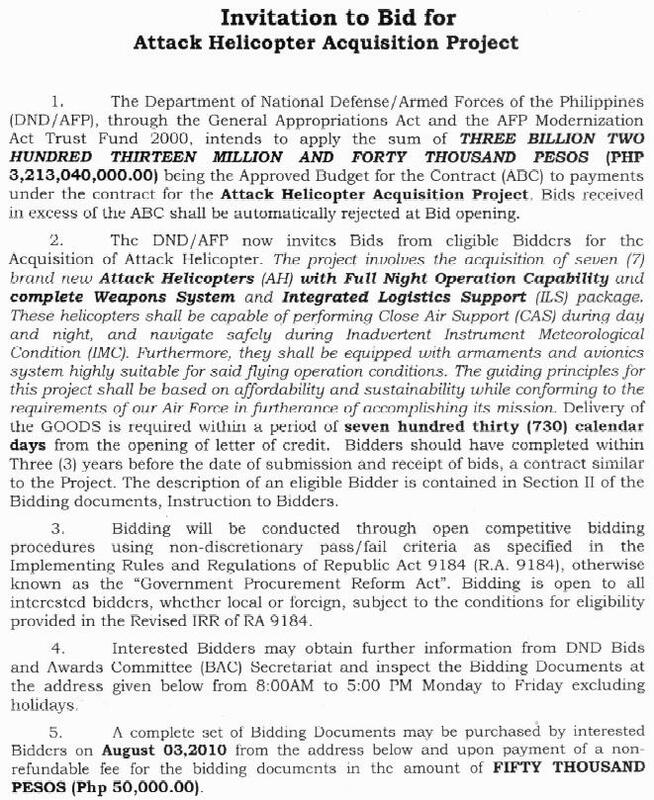 The Philippine Star confirmed what had been feared on the Timawa.net forum for months, the most recent attempt by the Philippine Air Force to acquire all-weather attack helicopters, had failed. It was the fourth project in a series of attempts that dated back to 2006. The focal point for this effort were ten (10) Eurocopter AS550 Fennec helicopters that were reportedly originally destined for Pakistan. 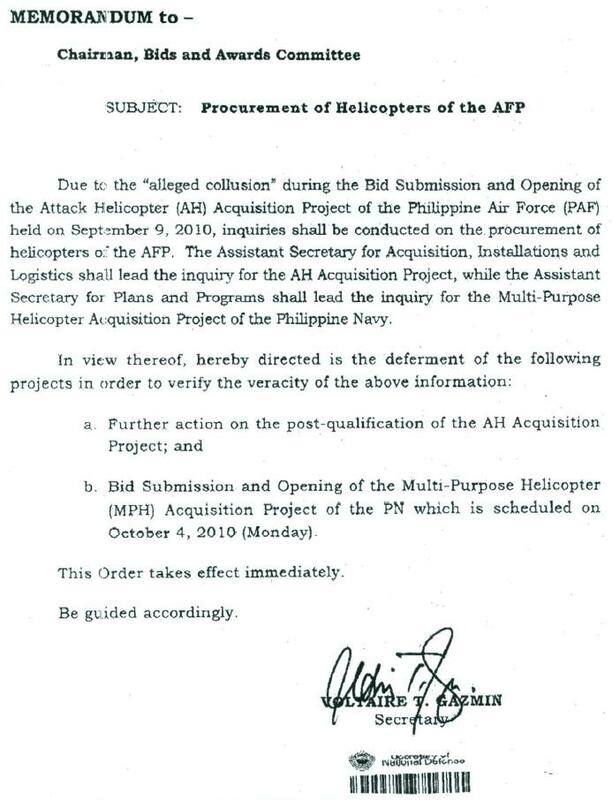 The deal had been aborted, and Eurocopter sought alternative buyers for the helicopters that had already been manufactured and were simply in storage. Enter the Philippine Air Force. The PAF had initially been slated to award Project #AFPMP-PAF-00-06-042 to Agustawestland for the armed version of its W-3 Sokol helicopters. Earlier, this company had received a contract for 8 of the transport version of this aircraft for the Combat Utility Helicopter (CUH) project. However on September 2010, the then incoming Secretary of National Defense, Voltaire Gazmin, issued a memorandum suspending further action on the Sokol-tender. The memorandum, which appears below, cited “possible collusion” as the rational for the deferment, which eventually became a cancellation that then led to the Fennec deal. After years of delays, the prospect of acquiring ready-to-go aircraft that were merely in storage appeared to be the ideal option. 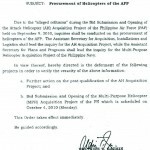 The PAF, through the Department of National Defense, sought to acquire the Fennecs through a government-to-government arrangement with France. 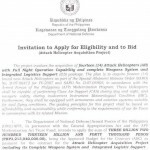 This was originally thought to be in accordance with the revised implementing rules and regulations issued by the Government Procurement Policy Board, which granted the DND leeway in pursuing negotiated procurement for modernization items provided it had Presidential approval. 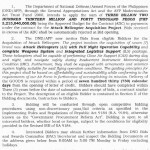 The DND sought the GPPB’s approval in June of 2012. The GPPB, however, denied this request citing that the DND was negotiating directly with the supplier of the Fennecs, and not the French government itself. 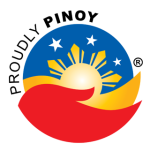 In November 2012, the Philippine Star reported that the GPPB reversed itself, and granted permission to pursue negotiations provided the French government was directly involved in the transaction. Unfortunately for the PAF, Pakistan had revived its acquisition effort for the 10 Fennecs in the interval between GPPB intereactions. Therefore when the DND returned to the negotiating table, the original helicopters were no longer available. Where the PAF goes from here, whether it pursues an order of new-build Fennecs, or it seeks alternative suppliers, remains unclear at this time. Prior to the Fennec and Sokol efforts, the PAF mounted the following unsuccessful attempts at supplementing its fleet of MD520 gunships with more capable helicopters that could operate at night. 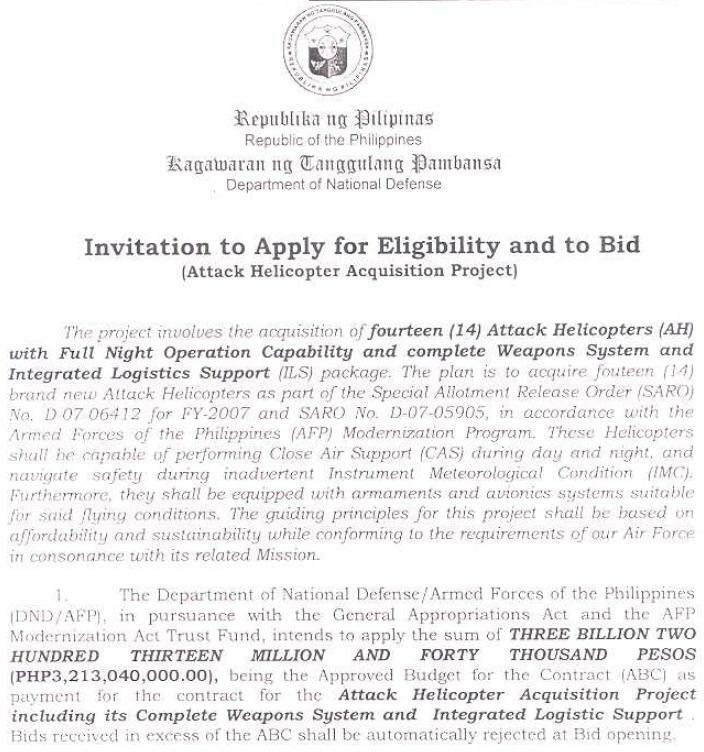 Night Capable Attack Helicopter (NCAH) TBA 6 P1,200,000,000 Initially awarded to Asian Aerospace for MD530F. Award decision on January 7, 2008 cancelled due to irregularities. See here for details.